The reissued Big Daddy has been redesigned to fly over twice as high as the retired version, up to 900 feet on an E motor. It now has laser cut fins and a contemporary new look. Put it all together, and Estes thinks that it may be the answer to the question "Who's your Daddy?" This is a Skill Level 2 rocket kit that they say will get you to the moon using an Estes E engine (what are those Estes blurb writers smoking?). If you prefer to keep it in the stratosphere (or shall we be more precise and say troposphere? ), it will also fly on your choice of C11 or D12 motors. The Big Daddy is a kit that, like all the rest of them, requires glue, modeling tools and paint. 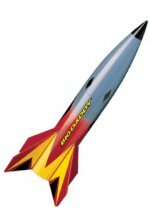 It includes great looking decals and a pre-assembled 24 inch parachute. But if you are putting a lot of work into your Big Daddy, consider uprating Estes' accident prone bin liner parachutes and knicker elastic recovery system with one of our Recovery Upgrade Kits. The Big Daddy has always been a favourite for hot rodders because it is a strong design and there's plenty of room for goodies inside. Imagine the pillar of flame and smoke if you converted it into a three or four way cluster ;-) Mind that CG shift, though!